(Nanowerk News) From a butterfly's iridescent wing to a gecko's sticky foot, nature derives extraordinary properties from ordinary materials like wax and keratin. Its secret is hierarchical topology: macroscale structures assembled from microscale components of varying sizes. Borrowing a page from nature's playbook, researchers at the National Institute of Standards and Technology (NIST) have developed a novel platform for the self-assembly of experimental hierarchical surfaces in a fluid. 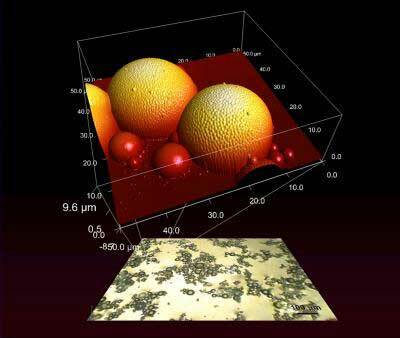 Their work offers diverse industries a new way to generate and measure self-assembly at the nano-scale. A butterfly's wings shimmer because light plays upon tiny rows of scales, like tiles on a Spanish roof. The gecko sticks to surfaces because its feet are patterned with microscopic hairs, each hair tipped with hundreds of even tinier projections. Beads of water roll off the lotus's leaf because its surface is streaked with microscopic peaks, each with a finer structure, that makes the surface "super hydrophobic." These enhanced properties--other possibilities include super adhesion and low friction--have attracted the attention of design engineers for applications from bioengineered tissues to photonic crystals to submarines that slice through water with minimal drag. Creating these topologically complex, self-assembled surfaces for study has been a challenge. If the components are mixed on a surface, that substrate affects how they assemble; if mixed in a solvent and dried, the drying process similarly distorts the results. In a recent paper (J.J. Benkoski, H. Hu, and A. Karim. Generation of hierarchical topologies from photocrosslinkable, particle-stabilized emulsions. Macromolecular Rapid Communications. Aug. 2, 2006), the NIST team detailed a much simpler and faster system they dubbed "fossilized liquid assembly" to create experimental models of hierarchical topologies in which the components are allowed to mix and assemble freely in a fluid, and then quickly "frozen" in place for study. The key is the use of solutions of water and a special monomer that polymerizes--links together--when exposed to ultraviolet light. Like an oil-water mixture, the fluid forms liquid interfaces that can be manipulated to create a desired hierarchical structure and then suddenly solidified with a burst of UV light. Lead researcher and physicist Alamgir Karim estimates that it takes about five minutes to make a sample of self-assembling particles using NIST's approach. Other methods, he notes, not only are more complicated and costly, but also do not allow the structures to form as freely. With the new technique, engineers also will be able to build complex dynamic structures and freeze them into solid form, studying self-assembly under the microscope. "How do you take a snapshot of shampoo in action?" asks physicist Jason Benkoski, first author of the paper. "We can now directly observe these small, mobile, delicate structures." The researchers also are using the new platform to better understand the fundamental physics behind the formation of hierarchical topology, studying, for example how different forces dominate at different scales of length. Looking ahead, the NIST team plans to build on this study, expanding the technology as a 3D imaging platform.